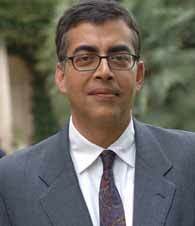 Pankaj Ghemawat is the Anselmo Rubiralta Professor of Global Strategy at IESE Business School and the Jaime and Josefina Chua Tiampo Professor of Business Administration (on leave) at the Harvard Business School. Professor Ghemawat earned his A.B. degree in Applied Mathematics from Harvard College, where he was elected to Phi Beta Kappa, and his Ph.D in Business Economics from Harvard University. He then worked as a consultant at McKinsey & Company in London before joining the Harvard Business School (HBS) faculty in 1983. In 1991, he was appointed the youngest full professor in HBS's history. He joined the IESE faculty in 2006. 2007 issue of Foreign Policy, and Global Integration ? Global Concentration (with Fariborz Ghadar), the lead article in the August 2006 issue of Industrial and Corporate Change. He has also begun a blog on global strategy, What in the World for Harvard Business Online. Professor Ghemawats book, synthesizing and extending his work in this area, Redefining Global Strategy, will be published by Harvard Business School Press in September 2007. Samuel J. Palmisano, the Chairman and CEO of IBM, has supplied an advance characterization: Pankaj Ghemawat has created an important strategic guidebook for leaders of the 21st century globally integrated enterprise. His analytic framework is both visionary and pragmatic aware of the broader historic trajectories of globalization, but grounded in the real kinds of decisions business leaders have to make in the here and now. And his caveats about semiglobalization provide a salutary reminder that massive change of this kind doesn't happen overnight. By basing his analysis on realworld case studies and a mastery of economic data, Pankaj Ghemawat will help CEOs and leaders of institutions make smarter decisions on one of the most important challenges we all face. Pankaj Ghemawats other books include Commitment, Games Businesses Play and Strategy and the Business Landscape. In addition, he is one of HBSs 10 best-selling case writers, serves as the Departmental Editor for Strategy at Management Science and, in 2007, was elected a fellow of the Academy of International Business. Keywords Pankaj Ghemawat, Why world is not flat, Globalization, Global Strategy, Global Strategy Blunders, Chine Vs India. Globalisation of the Indian Film Industry: Reel or Real?